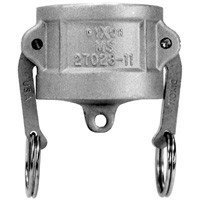 # DIX200-DC-MI - Type DC Dust Caps - Unplated Malleable Iron - 2 in. Type DC Dust Caps. Finger rings are not supplied on 1/2" - 1" "Andrews" couplings. * 1/2" Andrews has only 1" cam arm. Larger Sizes Available Upon Request.